Operating and financial statistics about an industry group (growth rates, margin trends, capital spending requirements, etc.). It is especially helpful in making assumptions for a discounted cash flow analysisDCF Analysis InfographicHow discounted cash flow (DCF) really work. This DCF analysis infographic walks through the various steps involved in building a DCF model in Excel.. The relative valuation of publicly listed companies. Comps are especially useful in that they can be used to assess if a publicly traded company is over or undervalued relative to peers. 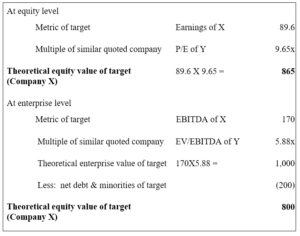 Valuation multiples from comparable companies may be applied to the financials of the target entity, giving a theoretical value of the target business. An indicative market price for a company that is to be floated on the stock market. The validity of terminal DCFWalk me through a DCFThe question, walk me Through a DCF analysis is common in investment banking interviews. Learn how to ace the question with CFI's detailed answer guide. Build a 5-year forecast of unlevered free cash flow, calculate a terminal value, and discount all those cash flows to present value using WACC. assumptions. Benchmarks for IPOInitial Public Offering (IPO)An Initial Public Offering (IPO) is the first sale of stocks issued by a company to the public. Prior to an IPO, a company is considered a private company, usually with a small number of investors (founders, friends, families, and business investors such as venture capitalists or angel investors). 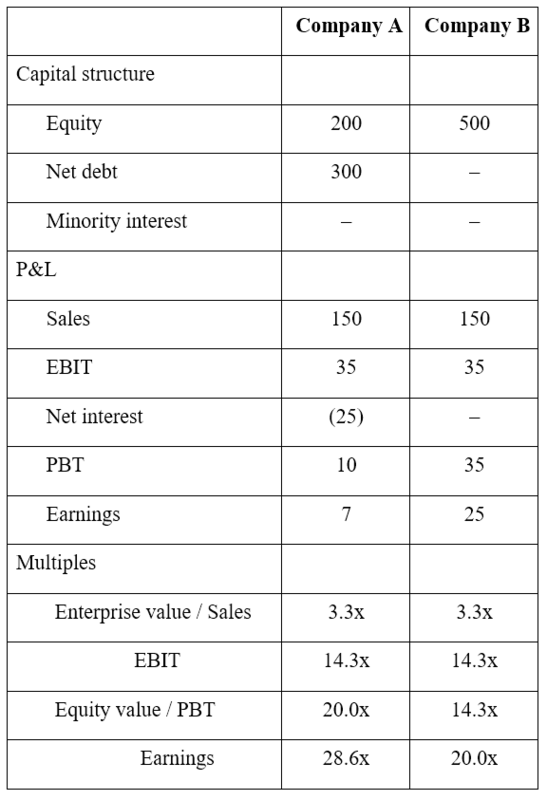 Learn what an IPO is valuations. Note: This is an excerpt from CFI’s free investment banking bookInvestment Banking ManualCFI's Investment Banking book is free, available for anyone to download as a PDF. Read about accounting, valuation, financial modeling, Excel and all skills required to be an investment banking analyst. This manual is 466 pages of detailed instruction every new hire at a bank needs to know to succeed. Essentially, be selective and specific when choosing comparable companies. More comparables are not always better! Enterprise value (EV) is a measure of a firm’s total value. Interchangeable terms for EV include entity value (EV), gross value (GV), total capitalization, firm value (FV), and others. 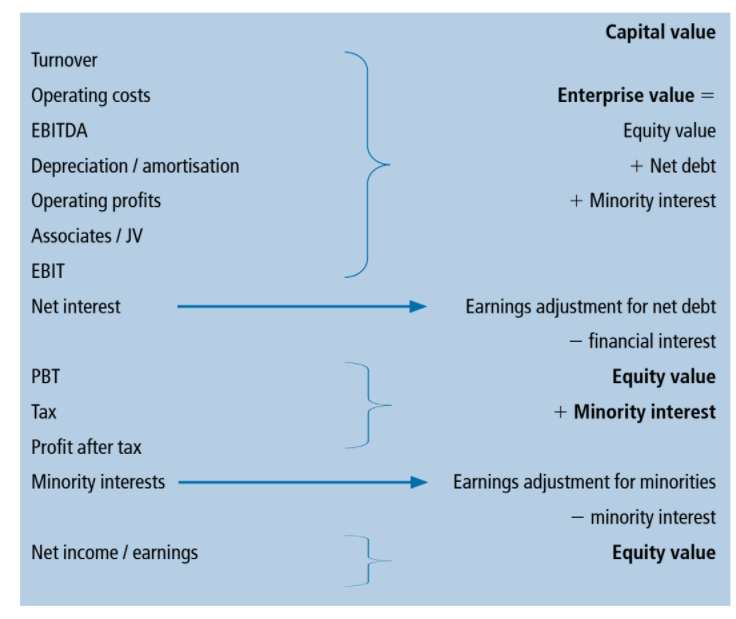 Equity value is the value of a company that is available to shareholders, synonymous with Market capitalization (MC). Net debt simply refers to the total debt of a company minus cash on hand. Preference share capital may be considered net debt due to its debt-like characteristics. As you can see in the image below, the different trading multiples are organized into groups based on the numerator in the multiples. If the numerator is above the interest line on the income statementIncome StatementThe Income Statement (or Statement of Profit and Loss) shows performance from operations of a business. 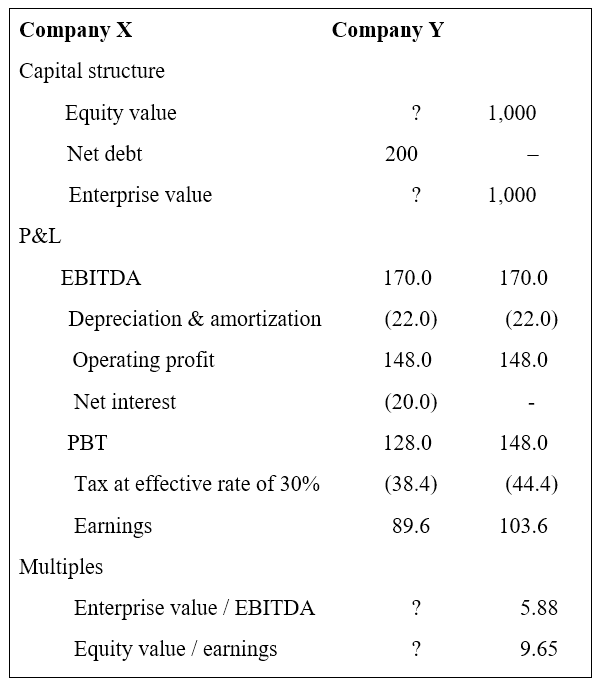 The financial statement begins with revenues and its an enterprise value multiple (like EV/EBITDAEV/EBITDAEV/EBITDA is used in valuation to compare the value of similar businesses by evaluating their Enterprise Value (EV) to EBITDA multiple relative to an average. In this guide, we will break down the EV/EBTIDA multiple into its various components, and walk you through how to calculate it step by step). If the numerator is below interest expense, then it becomes an equity value multiple, like P/E ratioPrice Earnings RatioThe Price Earnings Ratio (P/E Ratio) is the relationship between a company’s stock price and earnings per share. It gives investors a better sense of the value of a company. The P/E shows the expectations of the market and is the price you must pay per unit of current (or future) earnings. 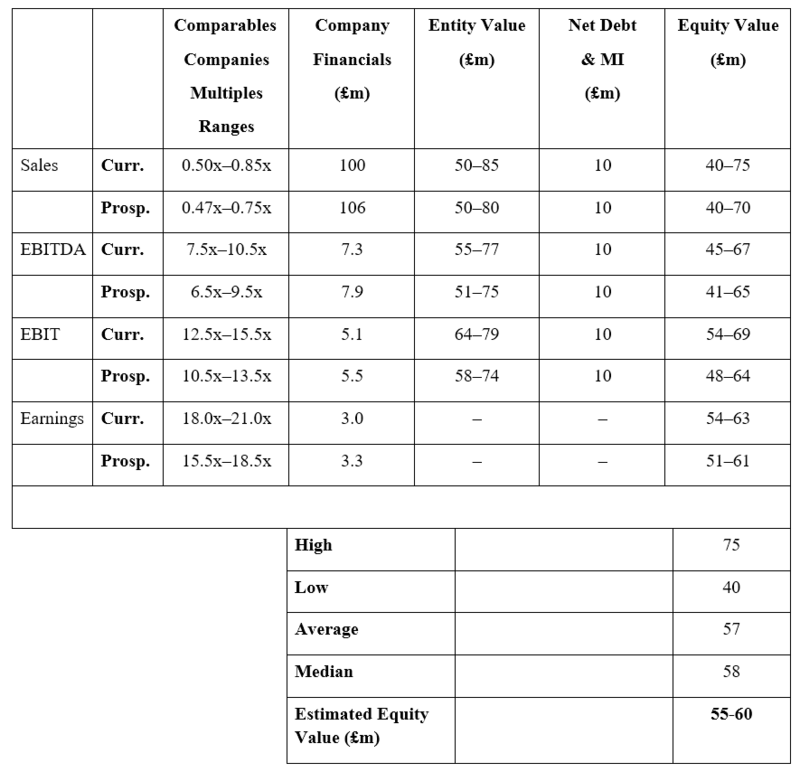 What is the development stage of the target company relative to comps? What is the appropriate comps universe trading on? Company X is to be valued using Company Y as a comparable company.